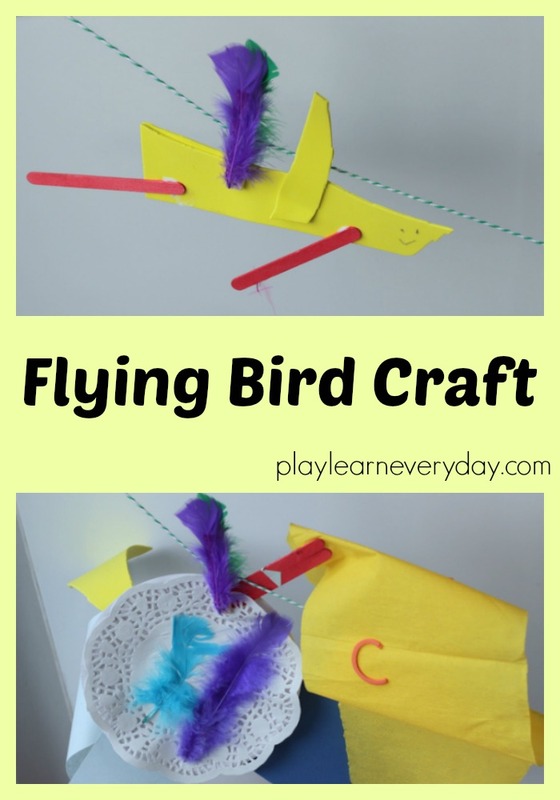 We've been busy making a bird craft that can fly (well sort of!) It's another one of our after school crafting creations, and Ethan absolutely loves these challenges. I set up a collection of materials on the table for him, and then he just gets to put them together in any way that he likes to make a bird. I set things up with a string that I tied from a door handle to the back of a chair and showed Ethan how we could slide a clothes peg along the string to make it fly across (a bit like a zip line) so that he could make a bird and attach it to the clothes peg to make it fly along the string. 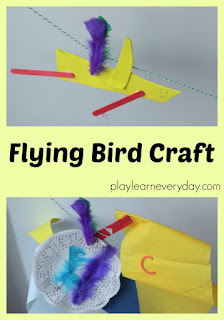 First we wanted to make our clothes peg look a bit more like a bird's wing, so we used some white glue to stick a feather on each side of it and then left it to dry. That was the only input that I had, then I just left Ethan to create on his own. He used all of the materials to make a massive bird with a paper plate body decorated with a doily and feathers. The bird's head is made from crepe paper, foam shapes and googly eyes. The legs are made from lolly sticks and bits of paper that he stuck on using the micro dots. He really enjoyed playing with these as they sort of make any bit of paper into a sticker, I think that they'll be a bit part of his crafting creations now. I was a little bit concerned that his first bird was a bit too big to fly on our zip line, so he made a smaller one as well, just in case. This bird he made by cutting up some foam sheets into a bird shape, with a foam wing and lolly sticks for legs. Both birds did actually fly quite nicely along the string and Ethan is having a lot of fun playing with them!